« Create My Logo Contest! 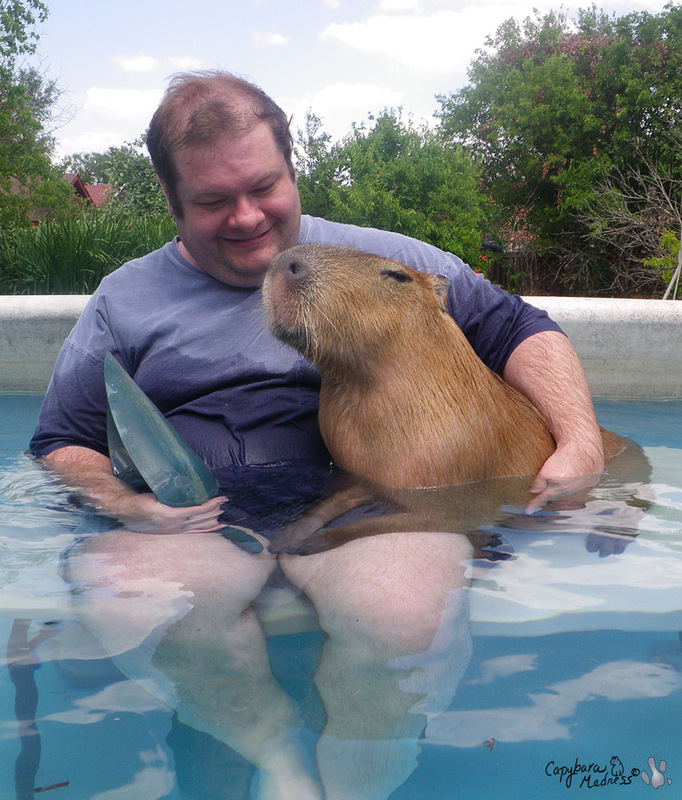 As a capybara, it is my job to brighten people’s lives. 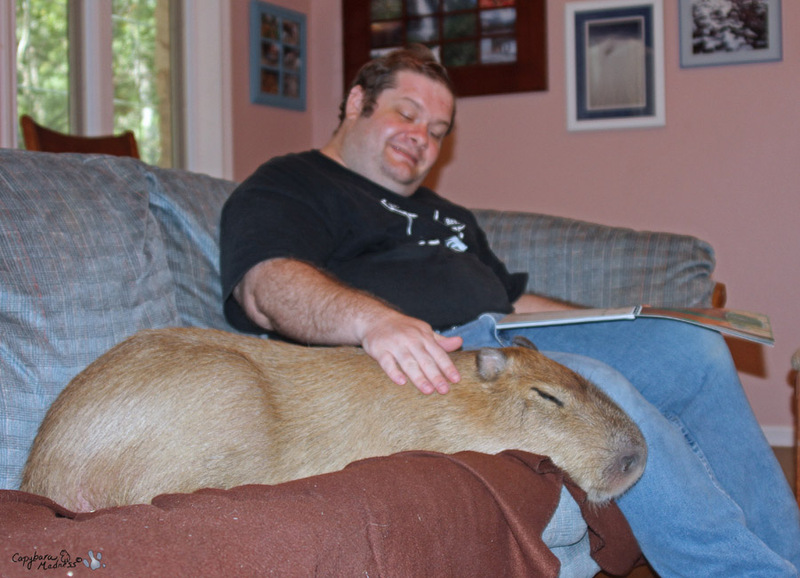 As a scardy-bara, this is much more difficult for me than it was for Caplin Rous. Caplin could go out in public and meet hundreds of people in one day. Not me, if people want to meet me they have to come to my house and see me on my own territory. Melly says someday I might get brave enough to go out someplace but I don’t see it happening. This week I had the opportunity to brighten the life of one of my Facebook friends, Mike Raiford. 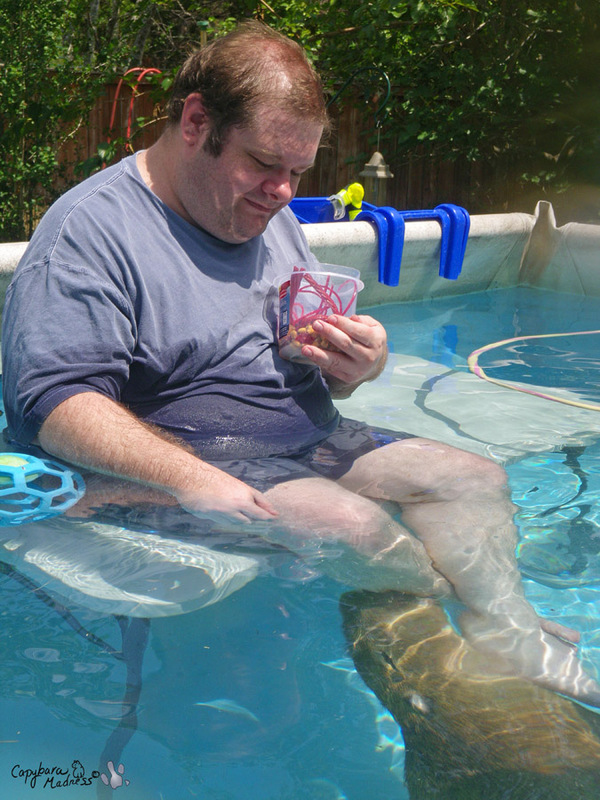 As you can see in the above photo, I even let Mike get in my pool with me! I thought I really liked Mike but I couldn’t be sure until I took a nibble out of his leg to see how he reacted. 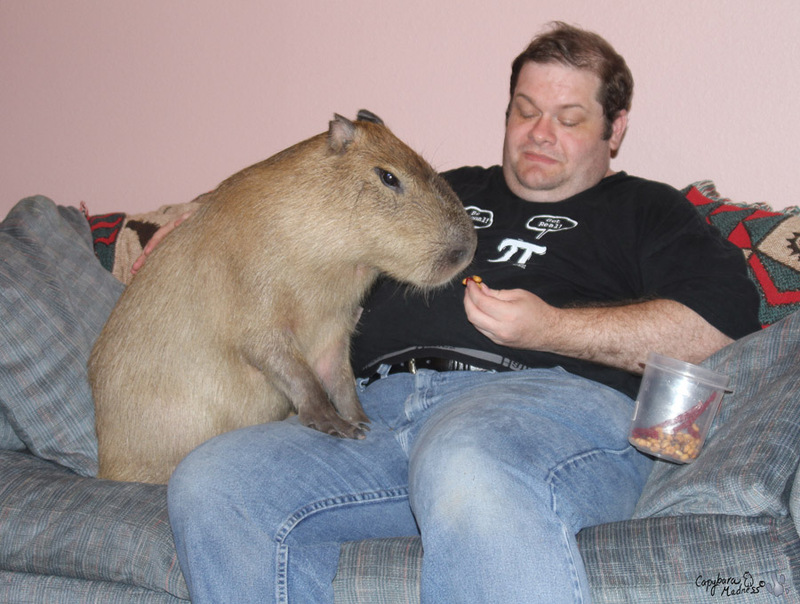 If a person is afraid of capybara teeth, they can’t really be my friend. I am all about the teeth. Mike took this very well. I didn’t break the skin or anything, just a little scrape of teeth against flesh. Melly was in the pool with us the whole time. I like to think she was there to protect me in case Mike tried to do anything mean. I have a sneaking suspicion that she was actually there to protect Mike in case I decided to bite him hard. Whose side is she on, anyway? If I decided to bite, I’m sure I’d have a good reason. Later, when we were in the house, I showed Mike just how large my teeth are so he would know that I could have hurt him if I really wanted to. The fact that I didn’t was a bond of true friendship. I think he got that. Okay, maybe I was yawning in that last photo. 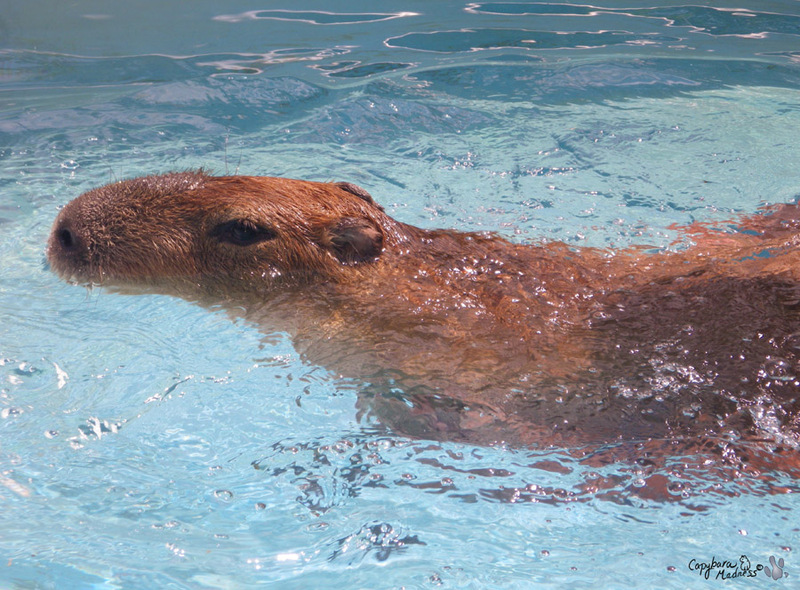 Swimming can make a capybara pretty tired. And to show Mike how much I trusted him, I let him pet me while I went to sleep. I don’t do that for just anyone. I’m pretty sure I would have liked Mike anyway, but the fact that he fed me treats did not hurt. Here he is giving me a corn nut. I love the salty flavor. As you can see, I have come a long way since I first arrived here in Texas. I am not only bigger, I am also braver. I used to hide behind the couch whenever visitors came. Maybe Melly is right, maybe I will be able to go out in public someday…in the far future. 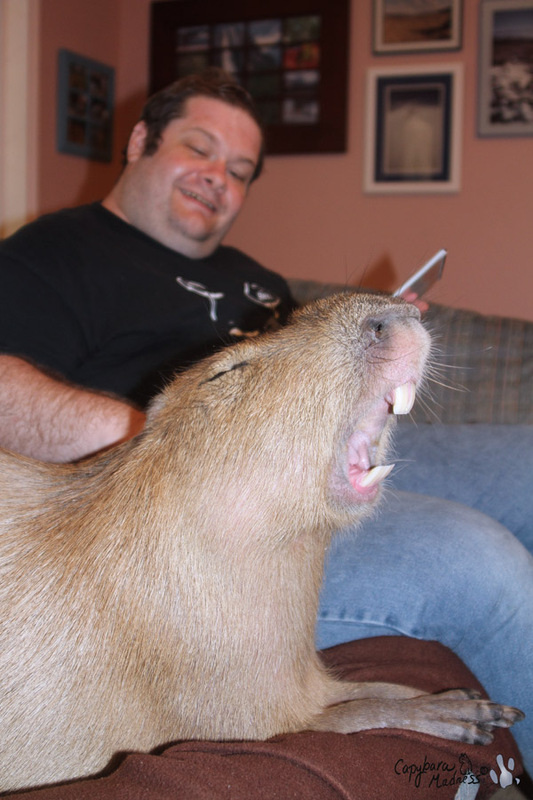 Wow this is the FIRST time I got to see a shot of capy teeth, upper & lower! Astonishing you’ve never bitten off a leg or an arm! Me, too! And up close and personal. Gari has quite a set. A bit of context, I’ve always feared bees. I’ve never been stung by one, but have watched my friends get stung. A bee flies by and a back up (screaming like a little child). 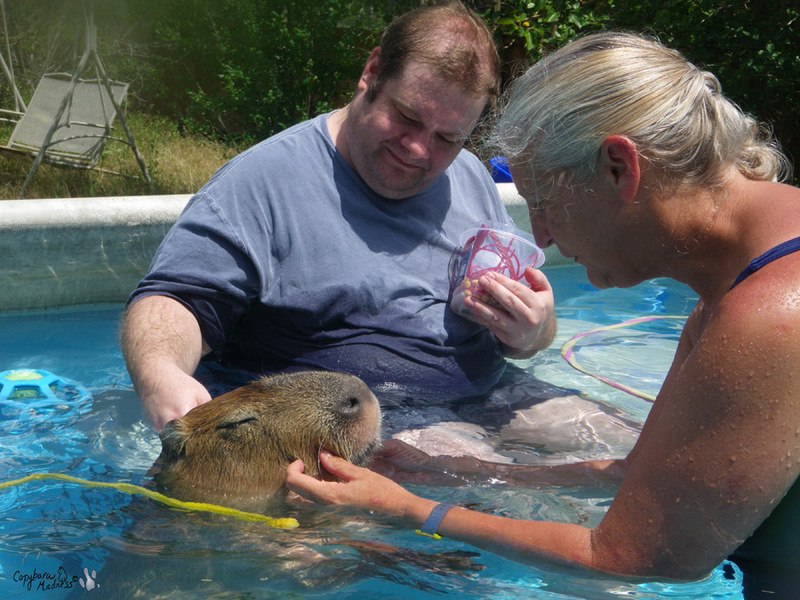 Melanie pipes up with, “Oh, you’ve been in the pool with a Capybara, but are scared of a little bee?”, “Yeah, I have a thing about bees.”, “Being in the pool with a Capybara is far more dangerous”, “Oh. Now you tell me …” I didn’t fully comprehend until Gari showed me those wonderful (and large… and sharp) teeth in his mouth. Then I had a sudden comprehension. And yet, I’d still do it again! I am wildly envious of Mike! Can I come visit you next year, Garibara? I’ll bring gummi bears! Love love love the first picture! It’s like you’re already besties! Lol. Gari is so adorable, how could you not love him?- impossible. 😀 Those are some pretty big teeth! I gotta say, I am super jealous of Mike!! My, what big teeth you have Gari! My little rattie girls have big teeth as well. Not as big as yours, of course, but pretty large compared to their bodies.